In this chapter we begin to develop the representation theory of Kac-Moody algebras. Here we introduce the so-called category O, which is roughly speaking the category of restricted h-diagonalizable modules (the precise definition is given below). We study the “elementary” objects of this category, the so-called Verma modules, and their connection with irreducible modules. We discuss the problems of irreducibility and complete reducibility in the category O. 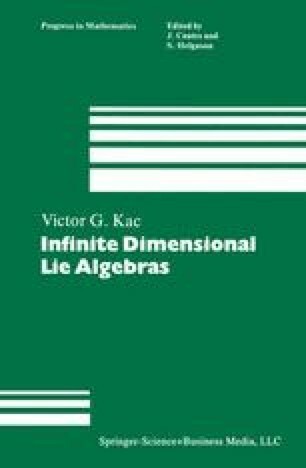 At the end of the chapter we find, as an application of the representation theory, the defining relations of Kac-Moody algebras with a symmetrizable Cartan matrix.